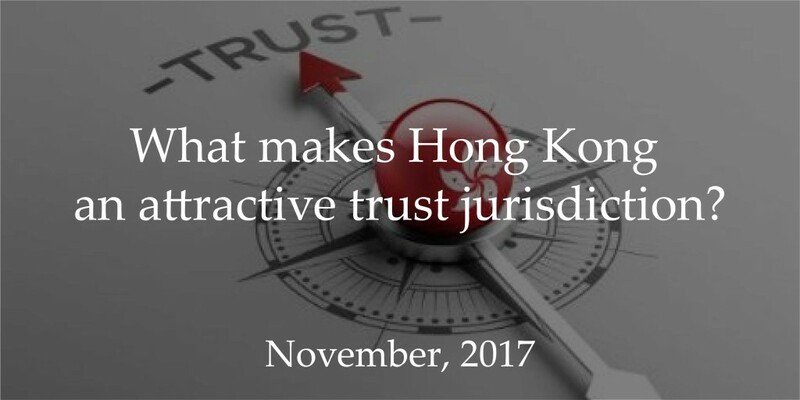 What makes Hong Kong an attractive trust jurisdiction? Over the years, we, Fung Yu CPA and Harris Corporate Solutions, have been working closely with entrepreneurs from various countries to build up their businesses. We witnessed their ups and downs, and we have always wanted to give them the best solutions in different stages of life. Attributed to the strong technical backgrounds (tax, audit & assurance, business consultancy) from both arms of our group; CPA firm and corporate services, starting from 2017 Spring, we have taken further steps in developing our personalized wealth planning services by broadening our range of services, such as immigration services, Hong Kong and overseas property agency and management services, etc. As requested by many of our existing clients, we started our private family trust services to complete our scope to cater our clients’ needs containing wealth creation, wealth preservation and wealth succession. Settlor: a settlor is a person who provides the assets to the trust. Beneficiary: a beneficiary is a person who is entitled to have the distribution from the trust fund depends on the designated terms of the trust. Trustee: a trustee has the legal ownership of the trust assets while it has the duty to control and administrate the trust assets for the benefit of the beneficiary as a whole and eventually distribute them in accordance with the terms of the trust. Succession planning: trust arrangement could provide flexibility on how to allocate the assets to your heirs or any of your loved ones according to your wishes. Avoidance of probate: when a settlor transferred its assets to a trust, the assets are no longer owned by the settlor but the trustee. It minimizes the time to deal with those assets in the event of settlor’s death and it may avoid inheritance taxes. Confidentiality: trust is a personal arrangement between settlor and trustee. It is not required to have the trust publicized so the distribution within a trust is strictly protected. There are many offshore financial centers that might offer different types of fiduciary services for high net worth clients (HNWC) to consider, but what makes Hong Kong more attractive than others? Perpetual Trusts permitted: there is no perpetuity period of a trust. Legal System and Judiciary: since Hong Kong’s trust legislation is based on English trust law, with a judiciary experienced in trust law, Hong Kong has become an attractive trust jurisdiction by giving a high level of confidence in the legal framework. English as the Business and Legal Language: the language used in commercial contracts and the legal system in Hong Kong is English. International Financial Centre: Hong Kong is one of the major international financial centers and stock exchanges in the world. Also, Hong Kong is a party to a wide range of international Tax Treaties. Comprehensive Investment Infrastructure: owing to the well support provided by different professionals in various areas, Hong Kong has become an ideal platform and vehicle for investment. International Business and Investment Hub: Hong Kong is a hub of international business in Asia due to its central geographic location. The well-developed transportation network, airport and telecommunications network facilitate business activities. Strong Anti-Corruption Laws: Hong Kong is a member of The Financial Action Task Force On Money Laundering (“FATF”) therefore Hong Kong fully subscribes to the FATF’s recommendations in combating money laundering and terrorist financing. For these reasons, the demand of Hong Kong trust has been increasing steadily over the years.